For more information about privacy and how we use the data we collect please see our GDPR page by following the link below. The Headteacher of Parklands High School is Mr S Mitchell. To contact the school, please write to, telephone, fax or email Mr Mitchell's PA, Mrs L Crow. Our SENCO is Ms L Williams. From junction 8 of the M61- exit the motorway and at the roundabout, take the third exit onto the A674. At the next roundabout take the second exit on to the A6 (Preston Road). At the next roundabout take the second exit on to the B5252 (Euxton Lane). At the the roundabout, take the second exit remaining on the B5252 (now West Way). At the roundabout, take the first exit onto the A581 (Southport Road) and continue for about half a mile. As you pass Woodlands conference centre on the right, Parklands is on the left. Continue past the school to Glamis Drive. Turn left into Glamis Drive and then immediately left into the school car park. From junction 28 of the M6 - exit the motorway and follow signs for Chorley on the B5256 (Lancaster Road). Take the first right onto the A49 (Wigan Road) and continue for about two and a half miles to the roundabout. At the roundabout, take the first left onto the B5252, (Balshaw Lane). Continue on the B5252 (crossing 2 roundabouts). At the final roundabout, take the second exit onto the A581 (Southport Road), and continue for about half a mile. As you pass Woodlands conference centre on the right, Parklands is on the left. Continue past the school to Glamis Drive. Turn left into Glamis Drive and then immediately left into the school car park. 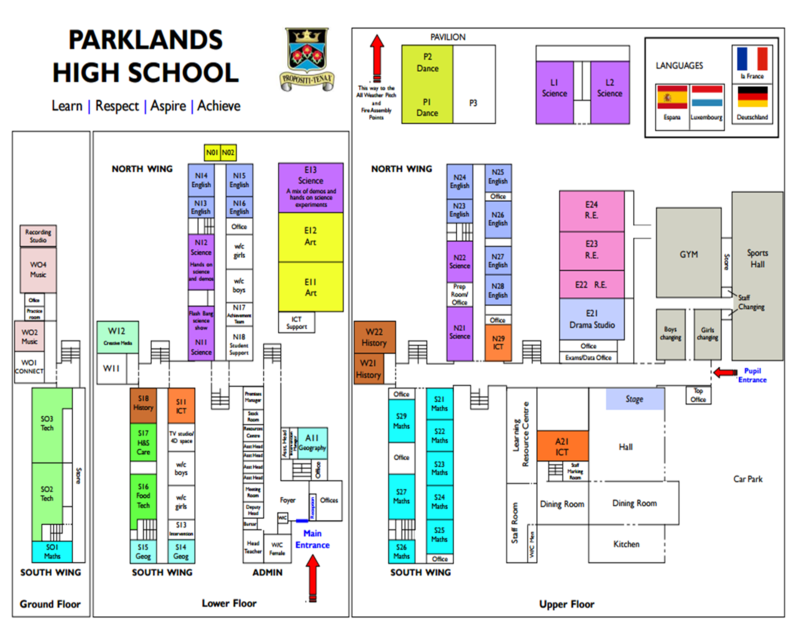 Once at school please enquire at the main visitors entrance (not the pupil entrance), to collect a visitors ID badge and lanyard. The pupil entrance is secured at 9.20, but visitors to the school will always be directed to the visitors entrance. For safety and security reasons, both pupils and staff have been directed not to allow members of the public access (at any time) via the pupil entrance. Enquiries sent using our online system will be acknowledged with an automated email response. If you do not receive an email confirmation then please email the Headteachers' PA directly.